This article has been reproduced with permission from QSX Software Group, the creators of the amazing Color Wheel Pro program. Color Theory is a set of principles used to create harmonious color combinations. Color relationships can be visually represented with a color wheel  the color spectrum wrapped onto a circle. According to color theory, harmonious color combinations use any two colors opposite each other on the color wheel, any three colors equally spaced around the color wheel forming a triangle, or any four colors forming a rectangle (actually, two pairs of colors opposite each other). The harmonious color combinations are called color schemes  sometimes the term 'color harmonies' is also used. Color schemes remain harmonious regardless of the rotation angle. The monochromatic color scheme uses variations in lightness and saturation of a single color. This scheme looks clean and elegant. Monochromatic colors go well together, producing a soothing effect. The monochromatic scheme is very easy on the eyes, especially with blue or green hues. You can use it to establish an overall mood. The primary color can be integrated with neutral colors such as black, white, or gray. However, it can be difficult, when using this scheme, to highlight the most important elements. Pros: The monochromatic scheme is easy to manage, and always looks balanced and visually appealing. Cons: This scheme lacks color contrast. It is not as vibrant as the complementary scheme. Pros: The analogous color scheme is as easy to create as the monochromatic, but looks richer. Cons: The analogous color scheme lacks color contrast. It is not as vibrant as the complementary scheme. Avoid using too many hues in the analogous scheme, because this may ruin the harmony. Avoid combining warm and cool colors in this scheme. For best results, place cool colors against warm ones, for example, blue versus orange. If you use a warm color (red or yellow) as an accent, you can desaturate the opposite cool colors to put more emphasis on the warm colors. Avoid using desaturated warm colors (e.g. browns or dull yellows). Try the split complementary scheme; it is similar to the complementary scheme but offers more variety. Avoid using desaturated warm colors (e.g. browns or dull yellows), because this may ruin the scheme. The triadic color scheme uses three colors equally spaced around the color wheel. This scheme is popular among artists because it offers strong visual contrast while retaining balance, and color richness. The triadic scheme is not as contrasting as the complementary scheme, but it looks more balanced and harmonious. Pros: The triadic color scheme offers high contrast while retaining harmony. Choose one color to be used in larger amounts than others. If the colors look gaudy, try to subdue them. The tetradic (double complementary) scheme is the richest of all the schemes because it uses four colors arranged into two complementary color pairs. 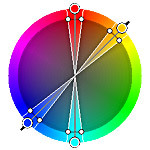 This scheme is hard to harmonize; if all four colors are used in equal amounts, the scheme may look unbalanced, so you should choose a color to be dominant or subdue the colors. Pros: The tetradic scheme offers more color variety than any other scheme. Cons: This scheme is the hardest scheme to balance. If the scheme looks unbalanced, try to subdue one or more colors. Avoid using pure colors in equal amounts.